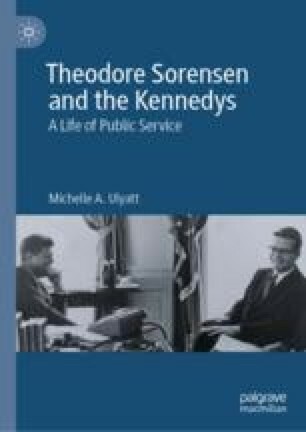 This chapter details Theodore Sorensen’s influence over national political life after 1970. It examines his run for the Senate in 1970 and his nomination for the role of Director of Central Intelligence in 1977. The chapter also assesses the impact of Sorensen’s legal work and how it fulfilled his political beliefs. Ulyatt outlines the role Sorensen played in supporting a new generation of political leaders to live up to the promise of the Kennedy legacy. The chapter examines his work with Gary Hart in the 1980s, his role in shaping Democratic Party programs in the 1990s and his involvement in Barack Obama’s success in 2008. Ulyatt argues that Sorensen’s work helped to educate the American people about politics and to inspire them to value public service. Buckley, Tom. 1970. “Ottinger: Study of a Quiet Candidate.” The New York Times, October 25. https://www.nytimes.com/1970/10/25/archives/ottinger-study-of-a-quiet-candidate-ottinger-a-quiet-candidate.html. Goldstein, Tom. 1976. “The Law Firm That Stars in Court.” The New York Times, December 19. https://www.nytimes.com/1976/12/19/archives/the-law-firm-that-stars-in-court-the-clients-are-notedso-are-the.html. Greenfield, Jeff. “Remember 1984. The Year of the Lengthy Primary Season We Now Long For.” Slate, September 7, 2007. http://www.slate.com/articles/news_and_politics/politics/2007/09/remember_1984.html. Kennedy, Caroline. 2008. “A President Like My Father.” The New York Times, January 27. https://www.nytimes.com/2008/01/27/opinion/27kennedy.html. Kennedy, John F. 1961. “Inaugural Address, January 20, 1961.” John F. Kennedy Presidential Library and Museum. https://www.jfklibrary.org/Asset-Viewer/BqXIEM9F4024ntFl7SVAjA.aspx. Obama, Barack. 2008. “President Barack Obama’s Inaugural Address, January 21, 2009.” The White House Archive. https://obamawhitehouse.archives.gov/blog/2009/01/21/president-barack-obamas-inaugural-address. Rowley, Storer. 1984. “Reagan Borrowing Glow of Past Democratic Heroes.” Chicago Tribune, October 7. https://www.newspapers.com/newspage/388487027/. “The Rejection of Sorensen: A Drama of Human Failing.” The New York Times, February 2, 1977. https://www.nytimes.com/1977/02/02/archives/the-rejection-of-sorensen-a-drama-of-human-failing-in-rare-defeat.html. Toobin, Jeffrey. 2008. “Amanuensis.” New Yorker Magazine, May 12. https://www.newyorker.com/magazine/2008/05/12/amanuensis. Zeleny, Jeff, and Carl Hulse. 2008. “Kennedy Chooses Obama, Spurning Plea by Clintons.” The New York Times, January 28. https://www.nytimes.com/2008/01/28/us/politics/28kennedy.html. Zezima, Katie. 2008. “Standing in for Kennedy, Obama Embraces Legacy.” The New York Times, May 26. https://www.nytimes.com/2008/05/26/us/politics/26wesleyan.html.